OPINION: What are the risks in the economic outlook for Australia? Typically, prognosticators take a scenario-based (aka “story-telling”) approach to answering this sort of question. And usually these scenarios end up as a litany of woes about what the future holds (such as weak productivity growth, unfunded fiscal liabilities, and highly unfavourable demographic trends). But for most economists gathering at the Joint Econometric Society Australasian and Australian Conference of Economists Meeting in Hobart next week, the more natural approach to answering this question is to consider formal econometric analysis of the macroeconomic data. Without going into the gory details of how to do this, I want to provide a sense of what such analysis says about the short-run and long-run risks in the economic outlook for Australia. I consider two key indicators of economic activity: output growth and inflation. The short-run risks are captured by statistical distributions for these indicators, while the long-run risks relate to possible changes in these distributions. 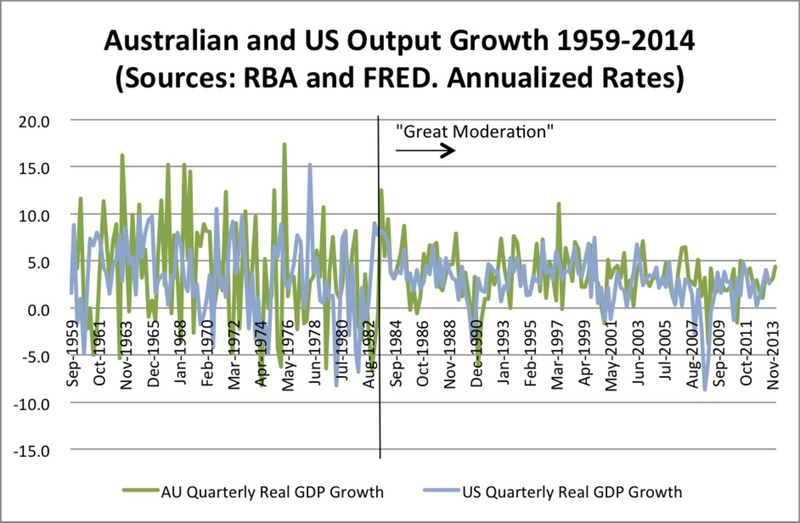 The graph below plots output growth for Australia and the United States. It’s clear from the graph that output growth for both countries has been much less volatile since the mid-1980s. Economists, who like to label everything as “Great” (e.g., the “Great Depression” and the “Great Recession”), refer to this stabilization as the “Great Moderation”. Even a casual glance at the graph makes it clear that the Great Moderation was not a myth, as has been asserted by some commentators, but is very real. Yes, the US economy had large negative growth rates in 2008. But since then, output growth has been stable, if lacklustre. Australian output growth also remained stable throughout this period. The reasons behind the Great Moderation are highly contested. But at least a couple of leading explanations suggest it should persist in the future. The most compelling explanation is that the economy now faces “smaller shocks” due, in part, to a changing structure towards services and away from manufacturing (although the reduced volatility occurs within services and manufacturing, not just due to their shifting importance). Also, monetary policy likely played some role by stabilising inflation, leading to fewer movements along the “Phillips curve” (i.e., the short-run link between inflation and output). Note, however, that US output growth remained stable after the global financial crisis, despite the US Federal Reserve facing a “zero lower bound” constraint on interest rates. So a paramount role for monetary policy in stabilising output growth is doubtful. Consistent with the visual impression in the graph above, formal tests suggest the statistical distribution for Australian output growth has remained fixed since the mid-1980s. Based on this distribution, the short-run outlook has real GDP growing at a 3% annualised rate, with a standard deviation of 1.5 percentage points for year-on-year growth summarising the risk in this prediction. In words, output growth could well be 1.5% or 4.5%, but there is a low probability that it will be less than 0% or greater than 6%. Notably, a major recession along the lines of what happened to the United States in the global crisis is extremely unlikely based on this distribution, although other statistical modelling suggests the probability of some sort of recession for Australia is less remote, but still small, at close to 15% over the next two years. The graph below plots inflation for Australia and the United States. This graph shows that Australian inflation has been lower and less volatile since the early 1990s, especially in comparison to the 1970s. This pattern of stabilisation roughly mirrors that of US inflation, also plotted in the graph, although the timing is a bit later in Australia. 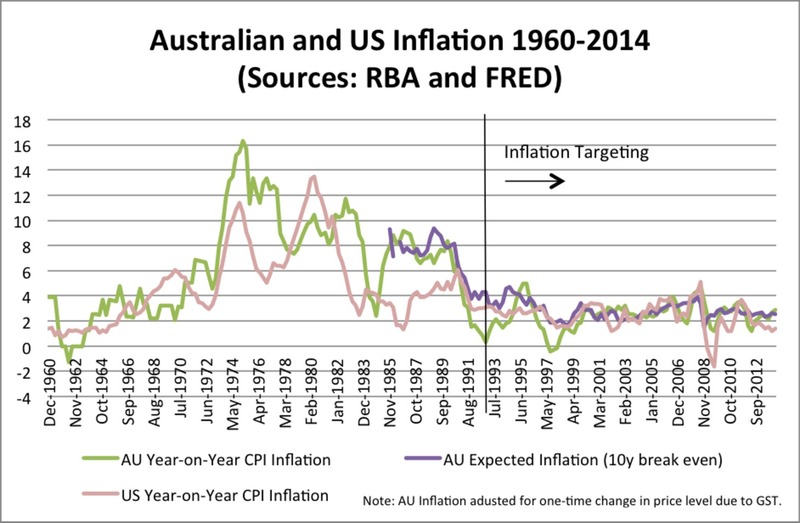 The stabilisation of US inflation in the early 1980s coincides with major changes in the Federal Reserve’s monetary policy at the time, while a link to monetary policy for Australia is strongly supported by the anchoring of inflation expectations (such as the measure also reported in the inflation graph based on the difference between yields for 10-year nominal and real Australian government bonds) at the start of the inflation-targeting era in the early 1990s. Consistent with the visual impression in the inflation graph and similar to output growth, formal tests suggest a fixed statistical distribution for Australian inflation in recent years, albeit since the early 1990s only when inflation targeting was put in place. Based on this distribution, the short-run outlook has inflation at a 2.5% annualised rate (exactly the midpoint of the RBA’s target range), with a standard deviation of 1.3 percentage points for year-on-year inflation summarising the risk in this prediction. In words, the headline inflation rate could well be 1% or 4%, but it is unlikely that it will be much more extreme than that. A major recession might push Australian interest rates to the zero lower bound, along the lines of what has happened in Japan, the United States, and Europe. However, if the RBA were to follow similar unconventional policies to those conducted by the Federal Reserve in recent years, the US experience suggests that inflation volatility should remain contained. The main long-run risks for the Australian economy are that the statistical distributions of output growth and inflation could change in some fundamental way, as they have in the past. Given the reasons for the past changes discussed above, it seems unlikely that output growth and inflation will return to their pre-Great Moderation patterns. A downside of this is that long-run output growth now appears to be lower than it was in the 1960s and 1970s. Furthermore, there is always a risk that long-run output growth could fall further. It is notable that the average growth rate for the Australian economy was as high as 5% in the 1960s when worldwide productivity growth was high, but has only been 2.8% over the last decade. At the same time, average growth has been reasonably steady since the mid-1980s. So an imminent end to economic growth, as might be suggested by the most dire scenario-based analysis, is quite unlikely. The key point is that to really understand the risks in the economic outlook, it is important to step back from a story-telling approach, no matter how compelling, and take an an objective look at the data. Doing so provides some encouraging bounds on the likely risks for the Australian economy. James Morley is a Professor of Economics and Associate Dean (Research) at the Australian School of Business, UNSW.